In Excel 2010, use the Increase Indent and Decrease Indent buttons in the Alignment group on the Home tab to change the indentation of cell contents. This feature is commonly used to enhance the appearance of table data by indenting subordinate text. Select the cells containing text you want to indent. On the Home tab, in the Alignment group, click the Increase Indent button. Each time you click the Increase Indent button, Excel adds a small amount of space between the cell border and the data itself. Indenting data helps to set it apart from other cells (see column A). If the data is left-aligned, Excel indents from the left. If the data is right-aligned, Excel indents from the right. If the data is centered, with the first click, Excel indents from the right; but subsequent clicks cause Excel to move the data from the left to the right. Select the cells containing the indented text. On the Home tab, in the Alignment group, click the Decrease Indent button. 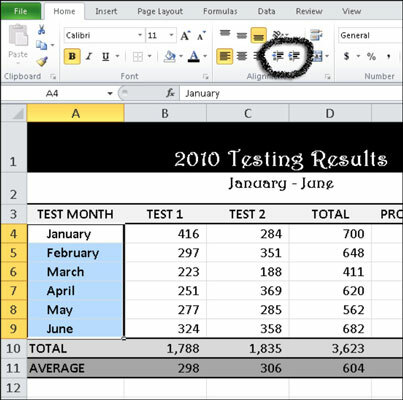 Each time you click the Decrease Indent button, Excel removes a small amount of space between the cell border and the data itself.